These pleasant wooden bungalows offer peace and quiet on the southeastern side of Koh Rong. Starfish Bungalows, located just past Treehouse Bungalows in the jungle between Koh Toch Beach and Long Set Beach, are some of the newest bungalows on the island. They don’t have a beach of their own, but the bungalows set among the trees, meaning you benefit from the shade, and you need only stroll around the corner to get to the beautiful and secluded Long Set Beach, or, if you head in the other direction, to Treehouse Bungalows’ yellow sand beach (which are open to non-guests if you purchase food or drink). Starfish has new bungalows on the far end of Koh Toch. Because the bungalows at Starfish are still new, they are in much better condition than most others that are currently available. They have either one double bed or two, with mosquito nets, and each bungalow has a private bathroom. Bungalows are fan-cooled and have cool water (it’s never that cold in Cambodia). 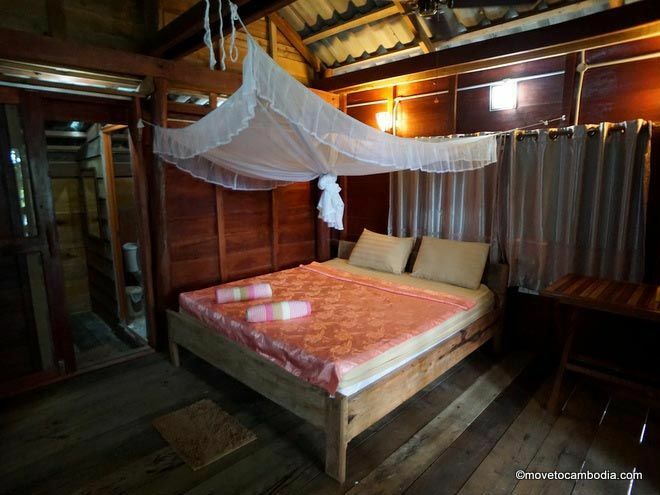 The wooden bungalows are pretty typical but are relatively large and have some nice features most of the other bungalows on Koh Rong lack, including a closet rail on which to hang clothing, shelves, and a table. 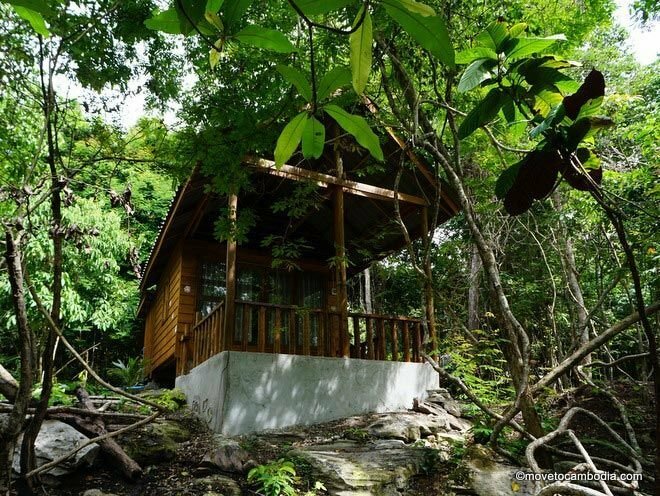 Each bungalow also has a private balcony where you can relax and enjoy the views of the jungle. There’s also an attached restaurant that serves a small menu and has WiFi. One of Koh Rong’s Starfish Bungalows. Starfish Bungalows is just five minutes from the quiet end of Koh Toch Beach, with Koh Toch pier about five minutes further down the beach. This could be a great choice for those who seek the peace and quiet of the more secluded and less accessible beaches but also want to be within easy reach of the dining options of Koh Toch. Online rates are lower than walk-in prices by as much as $10 per night. Check discounted rates on Booking.com.